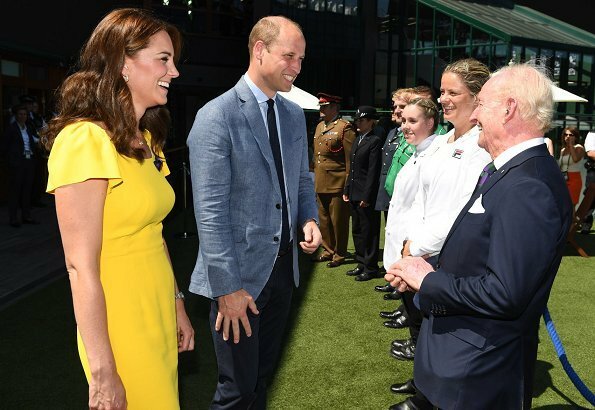 On July 15, 2018, Catherine, Duchess of Cambridge and Prince William attended the Men's Singles final on day thirteen of the Wimbledon Lawn Tennis Championships at All England Lawn Tennis and Croquet Club in London. 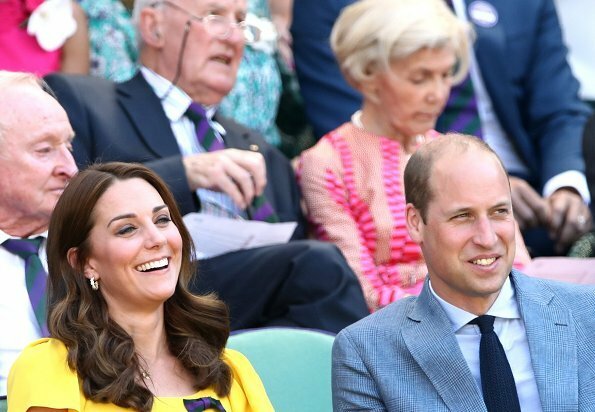 The Duke and Duchess of Cambridge arrived at Wimbledon to watch Kevin Anderson play Novak Djokovic in the men's final. The Duchess wore a new yellow cady midi dress by Dolce & Gabbana. Beautiful dress on a beautiful woman. Considering it's less that 20 weeks since she gave birth, she's in outstanding shape! I knew she would wear yellow. I thought she would wear a repeat, the yellow dress she wore in Australia, and I think she wore it once at Wimbledon too, but she chose a new dress. Love the Dolce and Gabbana dress! It fits her very well too and such a beautiful bright yellow! Love this - the style and the bright summery colour. I personally prefer Catherine's style when she wears something quite strong and striking. And the harmony between her and William is obvious. Is that Theresa May on the left? Bien sûr que non ,elle est du parti conservateur. Vérifiez avant de répondre ! Wow this yellow D&G dress is so right for today's Wimbledon visit. I must state Dss Cathrerine looks great.Little Louis is three months old and she has her former self back.Somehow not fair to the rest of us?. Duke of Cambridge seem to enjoy it as well. It seems Novak Djokovic,won. But like I said both of them look nice and rested. Very lovely, colorful look. She looks great. This last photo from her is absolutely stunningly beautiful. This is a perfect dress and color for Catherine. She seems so grounded and herself after her third child, a happy family life and a husband who adores her. She radiates perfect content and happiness. Good for her! Beth, you know a lot about fashion. I think Catherine looks even better than the model in that dress. What do you think? Beautiful...everything...the color and style of the dress, her hair is so pretty and healthy looking (would like to know her hair products!!) 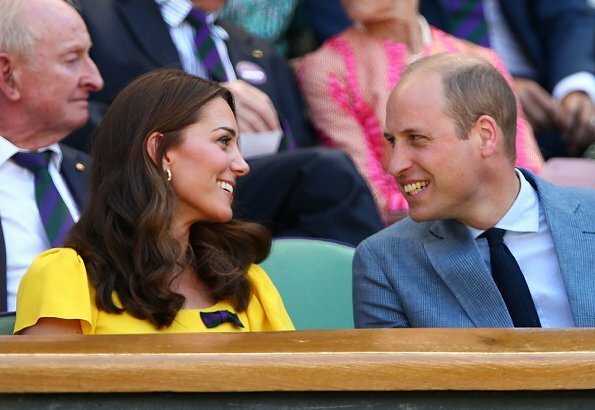 Nice to see the interaction of her and William. Absolute stunning, not every woman can wear yellow, but wow!! I love when she wears these colors. Agree with you CHERRY she looks Wow..
Beautiful! She’s so stunning!! I guess yellow is this summer color. I agree with Beth she radiates happiness. Love this couple. Agree with everyone. She's flawless and shining from the inside, too. Kate is practically a saint. She looks lovely, I never imagined she could wear yellow so well.. Love their glance in the last pic, they have such a good interpersonal relationship. First photo Kate looks like her Mom. The color and cut of the dress is perfect. And the way William and Kate look at each other, so much love there. Lovely dress. 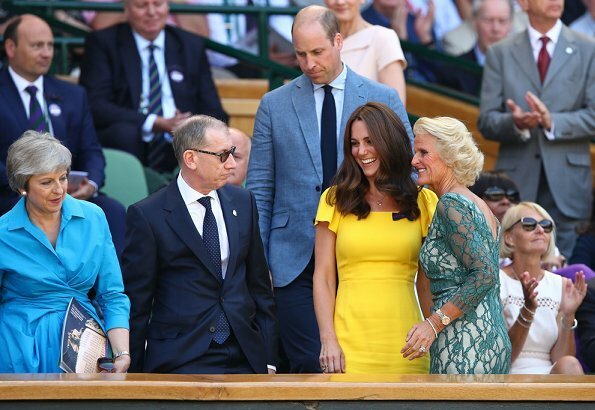 Catherine looks gorgeous in yellow.